The community enjoys creating beauty inside our church to match the beauty of our surroundings. At certain important times in our community life such as Advent, Lent, and Easter, teams coordinate the activity of decorating the church. On the first or second Sunday of Advent, we "green" the Sanctuary and the Seminar Room, putting up and decorating a tree in each room, hanging wreaths on the walls, and setting up our crèches. 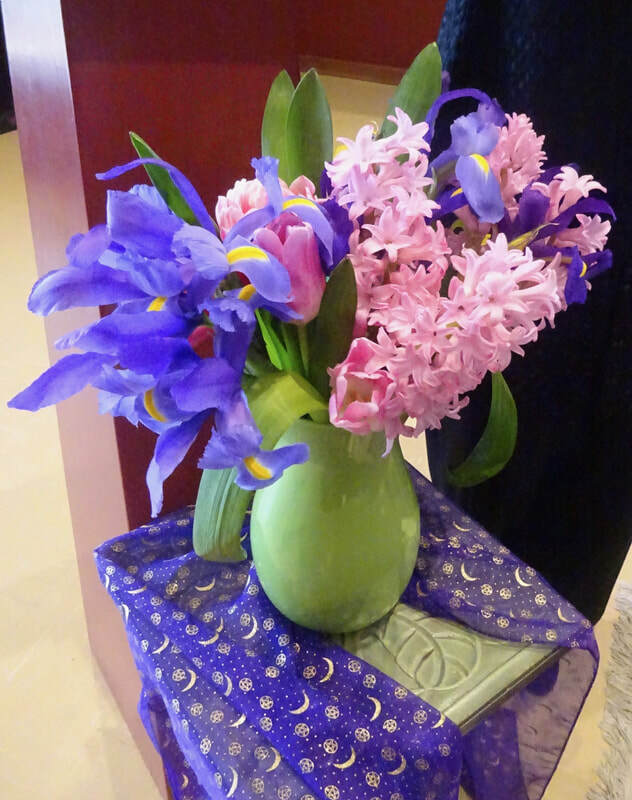 Please sign up on the flower chart near the kitchen for the dates you would like to provide and/or arrange flowers to grace our sacred space during Sunday services. Write down your phone number or email address so we can contact you regarding the dedication to include in the bulletins. 1. You may make a donation to CCC of $30 and someone on the flower team will buy and arrange the flowers for you. Let them know if you have a particular flower or type of arrangement in mind. 2. You may buy or provide flowers from your own garden and arrange them yourself. 3. You may choose to work with one of the team members to co-create the arrangements. Let our office manager know of your interest (415-435-9108), and she will contact the team.